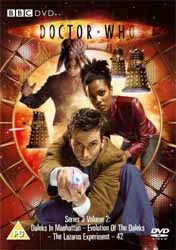 It has been pointed out to me that, in addition to the overt theme of the Doctor (David Tennant) getting over the loss of Rose and accepting Martha (Freema Agyeman) in her place, and the Mr Saxon arc, the third series of the revived Doctor Who is also peppered with allusions to the 1965 serial The Chase. For instance, both The Chase and Smith and Jones feature a vampire of sorts (a robot of Count Dracula and the Plasmavore Florence Finnegan respectively) and introduce a new companion played by an actor (Peter Purves and Freema Agyeman respectively) who portrayed a different character just three episodes earlier (Morton Dill and Adeola Oshodi respectively). Several instalments include visits to London (not that that's unusual for Doctor Who). The Shakespeare Code features the Bard and Queen Elizabeth I, while 42 makes mention of the "classical musicians" The Beatles, all of whom were depicted on the Time-Space Visualiser in The Chase. The two-part story Daleks in Manhattan / Evolution of the Daleks contains the most obvious Chase elements of all - time-travelling Daleks and the Empire State Building - as well as a reference to Frankenstein (inert human bodies being revived by lightning). This two-parter also has the dubious distinction of being quite the silliest Dalek story since The Chase, boasting some singularly uncharacteristic Dalek dialogue and a bunch of half-man half-pig slaves. To make matters worse, we had a pig person just two series ago, in Aliens of London. It's a bit too soon for the show to be repeating itself like this. Despite this serial's fundamental flaws, the visual thrills are as appealing as ever, including CGI mutations, aerial exterminations and glamorous showgirls. And it's always good to see the Daleks back in action, even under these reduced circumstances. Like many a classic Who story from the early Tom Baker era, the next two episodes on this DVD shamelessly purloin ideas from other popular fictions, mixing them up in the creative blender to produce exciting new concoctions. The Lazarus Experiment is a mutant hybrid of The Fly, Dr Jekyll and Mr Hyde and The Quatermass Experiment. There are also dialogue lifts from Star Wars and This is Spinal Tap. Of course, this isn't really Martha's final adventure with the Time Lord. Instead, he accepts her as a proper travelling companion from this point on. With the "getting over Rose" storyline now all but resolved (though the Doctor has yet to give Martha her own key to the TARDIS - he does that in the next instalment, 42), the Mr Saxon arc begins in earnest here. The politician and paymaster of Professor Lazarus (the wonderfully arch Mark Gatiss) is referred to several times, and this episode paves the way towards the events of The Sound of Drums / Last of the Time Lords. Intriguingly, the Doctor notes on several occasions the similarities between the process of regeneration and Lazarus' experiments in rejuvenation. The LazLabs logo, comprising series of circles, also bears a resemblance to Gallifreyan symbols. The CGI effects for the Lazarus mutation are good, though the creature's human face is a real letdown. Like the woeful Scorpion King in The Mummy Returns, it lacks convincing human expressions. Otherwise, this is a fine episode, if hardly experimental. Interestingly, the programme concludes not with the "coming soon" teaser for the rest of the episodes in this series, as was seen at the end of the broadcast version, but with a regular-style trailer for the next episode, which presumably was created and was the original artistic intention before it became clear that Doctor Who would take a break for a week to make way for the Eurovision Song Contest. A spaceship hurtles out of control towards an alien sun. Cut off from the safety of the TARDIS, the Doctor and Martha have just 42 minutes to save the crew and themselves. As the ship's personnel start to disappear, the Doctor discovers that they are not the only ones on board. And when Martha calls her mother for advice, why is her parent so keen to keep Martha on the phone...? Writer Chris Chibnall also raids ideas from Who's own past. The creepy killers in their protective suits are very Ambassadors of Death, with a hint of Pyramids of Mars thrown in for good measure (steam rising from a victim's shoulders). There's also a dash of Planet of Evil, insofar as the ship and crew cannot escape their fate until they return something a crewmember should not have taken. Another thing the episodes on this disc have in common with the early Tom Baker era is the Doctor's habit of screaming in hideous agony. As with Sutekh in Pyramids of Mars, the Doctor finds himself unable to resist his enemy's mental influence here. In both Evolution of the Daleks and Human Nature (on the next DVD), the Time Lord willingly exposes himself to a painful ordeal in order to achieve his goal, just as he does in Terror of the Zygons. Indeed, in both Evolution and Terror, the cause of the Doctor's suffering is an electrical current. The Doctor even admits to being scared - and I mean really scared - which is rare for him, making this a particularly strong, gritty and dark episode. Adding to the grit is a cast of guest actors renowned for roles in less than glamorous series: Michelle Collins (EastEnders), William Ash (Clocking Off) and Anthony Flanagan (Shameless). 42 might be considered too strong for little kiddies (you can tell it was written by a Torchwood writer), but I appreciate its harder-than-usual edge.